While the majority of Australis Engineering's production is in high end stainless steel conveyors, it also produces heavy duty conveyors for various areas of production. Australis Engineering has recently installed a number of heavy duty Pallet Conveyors designed to convey pallets weighing over 1.5 tons. These powered roller conveyors and powered chain conveyors are of powder-coated mild steel construction, and feature centre drives for bi-directional motion. Australis Engineering has also designed and built several large structural walkways and overhead platforms to accompany the conveying systems which it has installed. Australis Engineering manufactures both stainless steel and powder coated mild steel roller conveyors featuring powered line-shaft or tangential drive, as well as gravity Roller Conveyors. Roller types include stainless steel, galvanised and plastic to suit every application. Australis Engineering will design and build you an entire carton handling system to suit your exact need. Australis Engineering can incorporate such features are carton turning, multiple lane combining, lift-up sections for access, automatic and manual carton stops and full PLC integration for multiple sizes. 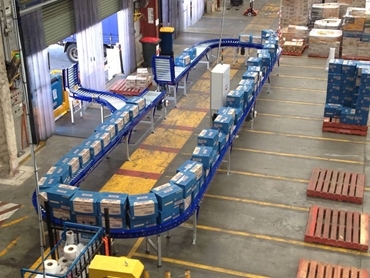 Compared to off-the-shelf roller conveyors, the Australis conveyors feature full stainless steel bodies and legs, with stainless steel side guide rails for durability. Australis Engineering specialises in food grade equipment, which means easy cleaning and a hygienic design to suit food processing area requirements.